In a recent paper in Science, Eric Rignot and Pannir Kanagaratnam present new satellite observations of the speed of glaciers of Greenland, and find that they are sliding towards the sea almost twice as fast as previously thought. Additionally, between 1996 and 2005, they detected a widespread glacier acceleration and consequently an increased rate of ice discharge from the Greenland ice sheet. However, previous papers have recently noted an increase in snow accumulation in the interior (i.e. Johannessen et al., 2005), so how do these different measurements fit into the larger picture of Greenland’s net mass balance? The measurements by Rignot and Kanagartnam were made with interferometers which measure the movement of the surface horizontally, and so is complimentary to the altimeter data published previously (which measures the absolute height of the ice). Overall, they found widespread increases in glacier speeds, and increases of about 30% in ice discharge rates. (Note that the satellite image shows that the glaciers in the east tend to slide far into the sea whereas on the western coast that happens less). The higher velocity of the ice is thought to be related to higher temperatures causing increased melt-water which can penetrate to the base of the glacier and hence reduce the ground friction. However, this accelerated movement is not necessarily tied to an increased rate of melting of the Greenland ice, although it can be related. Surges of ice streams from the ice sheet can also occur due to increased accumulation at the head of the glacier. However, when the increased ice velocity is matched to a decreasing thickness that can be sign of net mass loss. These ideas are consistent with observations of surface melting which had a record extent in 2005, and has been increasing steadily (though with significant interannual variability) since 1993. Using the analysis of Hanna et al (2005) (based on the reanalysis datasets) for the surface mass balance, Rignot & Kanagartnam estimate that Greenland is on balance losing mass, and over the period of their study the ice sheet mass deficit (the amount of ice lost to the sea) has doubled increasing from 90 to 220 km3/year (an increase of 0.23 to 0.57 mm/yr sea level equivalent – SLE). In the earlier Science paper, Johanessen et al. found increased snow accumulation on the top of the interior Greenland ice sheet between 1992 and 2003. Above 1500m a.s.l in much of the interior Greenland they estimated an increase of 6.4 ± 0.2 cm/year and below 1500m they observed a decreasing trend of -2.0 ± 0.9 cm/year. Hence, growth in the interior parts and a thinning of the ice nearer the edges. However, Johanessen et al. were not able to measure all of the coastal ranges. Indeed, the thinning of the margins and growth in the interior Greenland is an expected response to increased temperatures and more precipitation in a warmer climate. These results present no contradiction to the accelerated sliding near the coasts, but both will affect the ice/snow (fresh water) mass estimate. Whereas the finding of Rignot and Kanagaratnam suggests a larger sink of the frozen Greenland fresh water budget (the ice is dumped into the sea), the snow deposition in Greenland interiors is a source term (increases the amount of frozen fresh water). It does not matter for the general sea level in which form the water exists (liguid or solid/frozen) when it is discharged into the sea: The same mass of liquid water and immersed ice affect the water level equally (Archimede’s principle). A third relevant study is a recent paper in the Journal of Glaciology by Zwally et al. (2005) on the ice mass changes on Greenland and Antarctica. They use the same satellite obsevations (ERS 1 and 2) as Johanessen et al. and again find that the Greenland ice sheet is thinning at the margins (-42 ± 2 Gt/year = -46 ± 2 km3/year below the equilibrium-line altitude – ELA), but growing in the inland (+53 ± 2 Gt/year = 58 ± 2 km3/year). The mass estimates have been converted to volume estimates here, assuming the density of ice is 0.917 g/cm3 at 0°C, so that the mass of one Gt of ice is roughly equivalent to 1.1km3 ice*. This means that the Greenland ice has an overall mass gain by +11 ± 3 Gt/year (=10 ± 2.7 km3/year) which they estimated implied a -0.03 mm/year SLE over the period 1992-2002. The critical point for Greenland is whether the increased rate of glacier motion more than compensates for the greater accumulation on the surface. While the broad picture of what is happening is consistent between these papers, the bottom-line value for Greenland’s mass balance is different in all three cases. Looking just at the dynamical changes observed by Rignot & Kanagaratnam, there is an increased discharge of about 0.28 mm/year SLE from 1996 to 2005, well outside the range of error bars. This is substantially more than the opposing changes in accumulation estimated by Johannessen et al and Zwally et al, and is unlikely to have been included in their assessments. Thus, the probability is that Greenland has been losing ice in the last decade. We should be careful to point out though that this is only for one decade, and doesn’t prove anything about the longer term. As many of the studies make clear, there is a significant degree of interannual variability (related to the North Atlantic Oscillation, or the response to the cooling associated with Mt. Pinatubo) such that discerning longer term trends is hard. The largest contributions to sea level rise so far are estimated to have come from thermal expansion, with the melting of mountain glaciers and icecaps being of second order. Looking forward, the current (small) imbalance (whether positive or negative) of the Greenland ice sheet is not terribly important. What matters is if the melting were to increase significantly. Ongoing observations (most promisingly from the GRACE gravity measurements, Velicogna et al, 2005) will be useful in monitoring trends, but in order to have reasonable projections into the future, we would like to be able to rely on ice sheet models. Unfortunately, the physics of basal lubrication and the importance of ice dynamics highlighted in the Rignot & Kanagaratnam results are very poorly understood and not fully accounted for in current ice sheet models. Until those models include these effects, there is a danger that we may be under-appreciating the dynamic nature of the ice sheets. *Update: Correction for arithmetic error in orginal post in converting Gt to km3, see comments. I think it would be remiss not to also mention that longer-term variations in the Atlantic Multidecadal Oscillation (AMO)are likely impacting the current climate conditions in and around Greenland. There is a fine illustration (Figure 1) in Knight et al. (GRL, 2005) that shows this to be the case. Or, see the illustration from Goldenberg et al. (Science, 2001) reproduced here. Terrific post. Thanks for putting all the recent studies in context! This recent research is extraordinarily valuable. Having worked on one of the accelerating glaciers, Jakobshavns Isbrae in West Greenland, it seems difficult to slow these glaciers down. Their momentum is such that it is hard to envision a quick slow down now that the velocities have increased. The acceleration should reduce basal and sidewall friction and promote a continuation of the current velocity without a notable change in a boundary condition. I gather that even if the acceleration were found to be caused by a greater snow load pressing down on it, that could also at least in part be attributed to GW, since we expect increased precip (incl. snow) in that region from GW. Or am I missing some point? Very nice overview, but regarding your: “Unfortunately, the physics of basal lubrication and the importance of ice dynamics highlighted in the Rignot & Kanagaratnam results are very poorly understood and not fully accounted for in current ice sheet models.” This issue was dealt with only superfically in R&K by ref. to Zwally et al,2002. Surface melt-induced acceleration of Greenland ice-sheet flow. Science, 297(5579). Also, what R&K actually said is: “Current models used …. do not include such physical processes and hence do not account for the effect of glacier dynamics.” Inclusion of melt-acceleration was a central feature of the modelling by B. R. Parizek, R. Alley, Implications of Increased Greenland Surface Melt under Global-Warming Scenarios:Ice-Sheet Simulations, Quat. Sci. Rev. 23, 1013(2004), and most models do include glacier dynamics in some form. As it seems that there is quite a bit going on with modeling the ice dynamics, it would be nice to hear more about progress on that. It should also be noted that in the same issue as Rignot & Kanagartnam Science published a commentary by Julian Dowdewell synthesizing it and Johanessen et al, although I think the discussion was along the same lines as RC’s. Chip Knappenberger’s comment reminds me to also mention that the coal industry-funded World Climate Report (written by Chip and Pat Michaels) harshly criticized both R+K and the editors of Science based on the idea that R+K had ignored the results of J et al and that the editors were complicit in this lapse. In addition to the synthesis commentary I mentioned above, a quick fact check showed that the R+K paper was accepted for publication (i.e., was final) a few days before J et al was published, which is to say there’s a more than fair explanation for why the former didn’t cite the latter. In any case, as the RC post points out, R+K can hardly be accused of ducking the accumulation issue since they did discuss the results of Hanna et al. Drawing the obvious conclusion from all of this would get me into ad hom land, so I’ll leave it at that. Re #3 (MSP): Mauri, could you provide more information on the point you made? Is there a paper? Also, wouldn’t the existence of such an effect tend to argue against any sort of direct synchronization of the acceleration with the rather short-period NAO? This is speculative on my part as I am going to put 2 and 2 together here and suggest that if Greenland is not that significant then what is causing thermohaline slow down in the north atlantic ? Has your view that ‘thermohaline system is in fact fine…’ altered in the light of subsequent papers from Schlesingeret al. and the UK’s National Oceanography Centre? Jakobshavn Isbrae, Greenland, J Glaciology 50 (168): 57-66. These papers refer to other key papers as well. I would like realclimate to run an article on how in fact the ocean and air and the process of evaporation and precipitation are causing this effect will more water vapour and less or more rain result from human kind climate change. Surely if the density of ice is 0.917 g/cc, 1 km^3 of ice will have a mass of 0.917 Gt? I’m assuming that “Gt” is “gigatonnes”…. As discussed before in a few other topics, the retreat of Greenland glaciers started already a long time ago. For the largest one, the Ilulisat (Jacobshavn) glacier probably before 1850 (and according to another source, since the LIA, see Csatho ea., last paragraph). Unfortunately, we have no satellite measurements prior to the 1980’s, only aeral pictures which show a huge thinning of the glacier (70 m) in the early 1950’s. This thinning followed a very rapid retreat of the break-up point of the glacier in the period 1930-1950. Re: Thermohaline implications. Greenland melt isn’t the only source of extra freshwater for the North Atlantic. There’s also the extra river runoff due to increased precipitation over land and also decreased evapotranspiration due to the CO2 fertilisation effect on stomata. For those interested in paleoclimate, I would also point out that during the last period in Earth’s history when the global temperatures were more than 2Â°C warmer than modern (mid-Pliocene, ca. 3 Myr ago) there is strong evidence that the Greenland and West Antarctic ice sheets were gone….how long that takes to occur is something we sure would like to know. There is nothing , really nothing better than near live events as examples, such as North coast of Ellesmere Island Canada loaded with mountain and Fjord glaciers now having SAT’s +20-30 degrees C above normal. IR pics of Ellesmere shows it covered by what seems to be a huge very dark cloud,there are some, but a closer look merely demonstrates heat covering its huge landscape, totally a-typical, at this time of the year, Ellesmere would shine bright white, with -45 to -50 SAT’s instead of -9C , with imppecable clarity and contrast as seen from space with IR eyes. Further East, Greenland lost its IR white shine, greyish signatures is a norm on the ice cap during the last few winter years, while around its edges, darkness steep darkness. Re #17: Links to the site(s) with those pictures, Wayne? Many thanks for this post. It is a continuation of its many excellent predecessors. There is no real excuse for anyone, reasonably intelligent and interested (and who in our present circumstances would not be interested?) not to know the basics in the climate science field and to have, strongly or weakly held opinions on public policy as a consequence. I have to say that I become just faintly depressed when I read of scientists (in The Guardian 28th Feb on some “leaks” from the next IPCC) talking about, say, a 95% chance of everything being all right. They should be invited to run a lottery on the following proposition – roll up, roll up for the last chance saloon : stake all you have on buying a ticket, you stand a 95% chance of not losing and getting your money back but a 5% chance of losing everything – and see how many tickets they sell! Regarding #14: Well put Raypierre. In fact I published a paper in 1989 on “The Equilibrium balance of the Jakobshavns Isbrae”. This was based on observations from 1950-1988 when observations had begun that the terminus was stable, the mass losses from melt and calving equalled the snowfall, and that velocity had been consistent. The glacier had achieved relative equilibrium with climate during this interval. Thus, to rouse the glacier from this state, as has happened, did take a significant warming. This point is echoed by the same stable and then accelerating mass balance response of other Greenland Outlet glaciers. 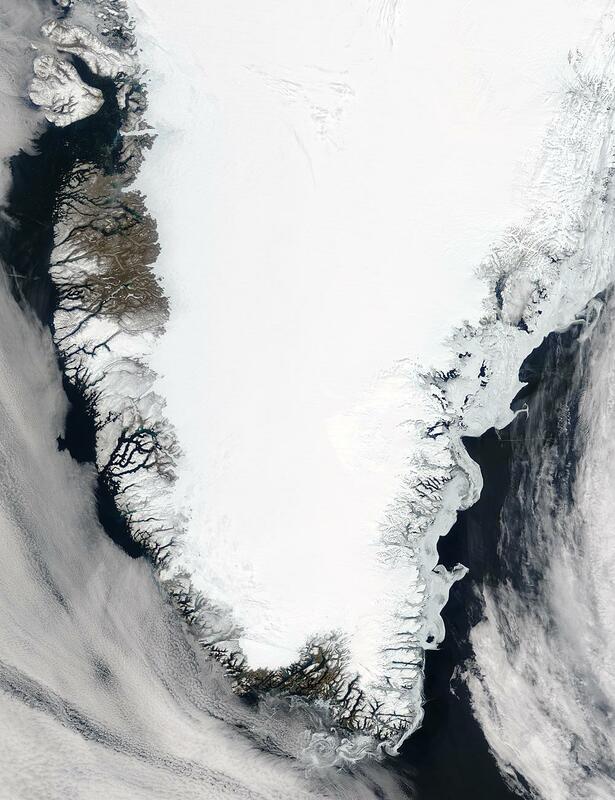 Something is afoot in Greenland, it is not ordinary and it is triggered by warmer conditions. I disagree. This is one of a number of crucial (if inconvenient) observations which bring into question the extent of the role of CO2 in climate. Is it me or is according to climate scientists the average global temperature rising but it is having no preceptable effect on the planet ? Greenlands glaciers are fine, river water run off could be happenning anyway, thermohaline system is fine and if it is weakening then it is not necessarily down to human made climate change, antartica is fine and if it is melting its a natural cycle, drought happens anyway and weather system and hurricanes are not different then before human made climate change was detected. So what and where is the problem if human made climate change is not affecting anything ? Thanks for your comment about the AMO in Comment #1. However, a quick check of my comment will show that I wrote that the AMO is “likley impacting the current climate conditions in and around Greenland.” I never said that it explained everything (although I supposed that it could). A multidecadal (50-80 year timescale) pattern of North Atlantic ocean-atmosphere variability whose existence has been argued for based on statistical analyses of observational and proxy climate data, and coupled Atmosphere-Ocean General Circulation Model (“AOGCM”) simulations. This pattern is believed to describe some of the observed early 20th century (1920s-1930s) high-latitude Northern Hemisphere warming and some, but not all, of the high-latitude warming observed in the late 20th century. The term was introduced in a summary by Kerr (2000) of a study by Delworth and Mann (2000). perhaps you ought to confer with your other Real Climate colleagues and tone down the part about the AMO signal in the Arctic. What evidence do you have that the recent warming in the North Atlantic around Greenland is NOT part of the AMO phenomena? Knight et al. (and the RC Glossary) clearly suggest that it is, and even go as far as to predict its future behavior. This record shows two periods of rapid thinning by about 70 meters, in the early 1950s and since 1997. Observed changes in glacier behavior during these two events are markedly different. The recent thinning, which involved several episodes of retreat followed by large thinning, resulted in a rapid retreat of the calving front toward grounding line. Thinning in the 1950s occurred during a period when the calving front was stationary with only minor annual fluctuations. Nevertheless, aerial photographs collected in the 1940s and 50s indicate that thinning extended far inland. To be noted: the retreat of the break-up preceding the 1940/1950 thinning. Thus may I disagree, and IMHO the current Greenland glacier retreat (still) is within “normal” limits? Which doesn’t include that GHGs play no role at all, but in the Greenland temperatures/glacier retreat this is not (yet) detectable (opposite to the average worldwide glacier retreat, but that will be discussed in a next message in reaction to the comment by Raypierre). I disagree with your disagreement. Your argument presumes the same causation for the time period in question. You haven’t shown that to be true. RE: #15. Consider the fact that there is drainage from the Canadian Shield’s array of slow moving surface waterways entering both the Arctic and Atlantic that is essentially relic water from the great melt. Consider also the damming of multiple north flowing rivers in Eurasia. General comment about this thread. Lots of energy going into explaining Greenland ice conditions in a way that tries to exclude / discredit naturally occuring oscillations. It is a mind set. Wasn’t that one of Crichton’s arguments against GW, that the Antarctic was gaining ice mass? Or was it simple getting colder? Re #4 – Again no proof but a statement “that could also at least in part be attributed to GW”. Do you have the temperature statistics for Greenland? Is it rising? the western Arctic may be, but is Greenland? Re #5, #11 and others – I do not see any proof that increased thickness is not causing some of the acceleration. Check the temperatures first. Re#27 It has been noted that the key accelerating glaciers have thinned considerably in the lower reach accompanying the retreat. Hence, there is not a thickenning of the lower reach of the glaciers that would influence velocity there. The change in ice thickness at the center of the ice sheet of less than a meter will hardly matter to an ice sheet that is generally over 1500 m thick. One can easily do the math on this to see the lack of potential influence. Also the response time of an outlet glacier to a climate change at its head is more than a couple of decades. However, changes at the terminus have an immediate impact on that area. Sadlov makes a good point about the lack of a detailed look in these papers at natural cycles, since they focus on such a short term data set. I will point that in a J of climate paper in 2002 by Jason Box, working with Greenland temperature records particularly near Jakobshavns, it is noted that from 1990-2001 a statistically significant warming of 2-4 C was observed in West Greenland which is statistically significant. It is also noted that the temperature record is highly correlated with NAO as one would expect. However, it the unusual degree of current warmth and melting that, leads me to suggest that this is stamped upon the existing natural trends accentuating the warm periods and dampening the cool periods. Do you have a citation that some of the current drainage is as you say (whatever that means)? Thank you. Do you have a citation that the current Greenland ice conditions are due to naturally occurring oscillations? And what are those oscillations? Thank you. Greenland’s temperatures are rising in some places, as Lynn implies. As Greenland is a large place, it is best to consider it not as a whole. I for one, do not appreciate political statements in a scientific dialogue. The peer-reviewed literature is filled with studies on naturally occuring oscillations and all possible causes for climate change including naturally occuring oscillations. Mauri – You are obviously all over this stuff. But couldn’t there be a “hydraulic press” type effect going on? I agree that a 1/1500th gain in depth on the central ice sheet is not huge, but if the pressure were channeled narrowly towards an opening that then reached a glacier, couldn’t it have a dramatic effect? Mauri, all stations around Greenland (as far as still in use) show a recent warming, but most stations don’t or just reach the 1930-1960 summer temperatures. Specifically the station in Ilulisat/Jacobshavn (West-Greenland), had a significant increase of 4 degr.C in the period 1920-1930. But it ceased operation in 1980. The nearby Egedesminde station started operation around 1950 and parallels the Ilulisat station within a few tenths of a degree for the yearly averages in the overlapping period. It shows a 4-6 degr.C cooling in 1979-1993 and a 5 degr.C warming thereafter. The temperatures after 2000 just reach the temperatures in the 1930-1960 period of Ilulisat. The same for summer temperatures, where temperatures after 2000 just reach the 1950’s for Egedesminde, but here is an offset against Ilulisat, the latter shows average 2 degr.C higher summer temperatures in the overlapping period. Thus for Greenland as a whole and West-Greenland in particular, there is little difference in temperatures between today and 65-85 years ago. The increase of CO2 in the period 1850-1950 was mainly by the use of coal (1-4% sulphur). SO2 emissions in that period were directly related to coal use (see e.g. the US figures), thus any effect of the 25 ppmv increase of CO2 on temperatures is (in part) countered by parallel increases of sulphate aerosols (this pleads against the huge influence of sulphate aerosols in the post-1945 period…). Thus the increase in global temperatures in the period 1850-1950 was mainly from natural variations (IMHO mainly solar, but internal oscillations may be involved too). Now back to the study of Oerlemans: This study shows that near all (extratropical) glaciers have their largest decrease in the period 1850-1950, but the average is relaxing after 1950, while the tropical glaciers are receding faster than ever. The latter seems not directly related to local/regional temperatures, but there is a trend to less clouds in the last decades in the tropics, which implies more direct sunlight (~2 W/m2) helping with the sublimation of ice fields. For mid-latitudes, clouds play less role in the radiation balance, but play an important role in precipitation. Thus in summary, there is little evidence for CO2 emissions influence on glacier retreat in the 1850-1950 period, and mixed evidence for an increased influence after 1950. Thanks for addressing the AMO. Anyone with experience with data handling knows you can apply time series analysis to any dataset and pull out ‘frequency modes’ that may or may not have anything to do with reality, even if you are working with an almost completely random dataset. These analysis are still valuable if they lead to a plausible mechanism or point towards an interesting phenomenon that may be buried under layers of other signals (such as El Nino, which does have a physical mechanism, if still under discussion whether it’s an atmospheric or oceanic driver). It’s worth noting in this context that the AMO was heavily played on a number of popular news shows as the cause of last year’s hurricane season. It looks like noone has a plausible mechanism of any kind for the AMO, however. With respect to #32 first. Most people tend to think of changes in glacier behavior being communicated from the head of the glacier to the terminus. However, in the recent glacier acceleration the acceleration is greatest at the terminus and is indetectable by the time you are 10% of the way to the head of the glacier. This indicates it is a change in the terminus region, that is changing the force balance within the glacier system. The Jakobshavns is easily 300 km wide in the upper accumulation zone and constricts to 6 km wide in the fjord reach. This constriction does lead to the glacier having such a rapid speed. The ice streaming nature of the glacier extends some 60 km inland from the terminus, but the acceleration does not extend this far. This is still only a small percentage of the distance to the head of the glacier and does not reach the area where thickenning is noted. A 0.67% increase in thickness in a portion of the accumulation area, will not make the glacier flow faster in the accumulation area. If it does not flow faster there it will not flow faster in the ice stream section. The glacier is 50 times thinner in the ice stream section but also moves close to 50 times faster, which is a necessary volume balance. Picture a traffic jam. If more cars come into the back of the traffic jam, and cars in front are forced ahead faster, how quickly does this affect flow at the front of the jam? An increase in traffic flow at the front of the jam does communicate somewhat into the jam? This is not ice, but does provide some reference. Second #34: We do not have data indicating that Greenland glaciers were moving faster during the period prior to 1950. Thus, the current change is not necessarily comparable. As to non-tropical glaciers I have seen four glaciers disappear in the last decade. Despite having already retreated, thus requiring even warmer conditions than before to continue the retreat, the rate and ubiquitous nature of current retreat in the Alps, North Cascades, Himalaya, Andes and other areas is unprecedented since 1900. Wikipedia Glacier Retreat covers this in detail. I have been tracking the global warming debate back and forth for some time now, and truthfully for someone who approaches the issue from objective point of view it is exhausting. The point, counterpoint, counter counterpoint, and so on is endless. I have no reason to believe your account over others, or their account over yours. Everything has ring of legitimacy and everything is cloaked in the interpretation of dubious statistics. We need a better model for this, we need a better model for that, we need more data here … I’m sorry, but as an outsider reading both sides I can only conclude there is a lot of passion but very little substance. No offense, but anything that has this many interconnecting parts, unknowns, overly simplistic models, and noisy data is getting nowhere slowly. We will just have to wait. Only then can we look back in retrospect to see who was right, and even then thanks to the miracle of cognitive dissonance, magically somehow those in the wrong will find a way to spin it so they weren’t really wrong after all. I give up. Re #37: I suppose you can come to that conclusion if you grant equal weight to the vast majority of climate scientists on the one hand versus a tiny handful of outliers (most of them funded by the fossil fuel industry) on the other. Simply waiting might be a little dangerous. Have you read Jared Diamond’s “Collapse”? Re #38: I’ve seen this ad hominem attack a few times. Could you list the scientists (outliers you call them) and which fossil fuel industry is funding them. Personnally, I feel the earth is warming. A proportion of this warming is natural variation and the rest is AGW. What that proportion is remains beyond my grasp. I think scientists on both sides of the debate are doing the best they can with limited knowledge to uncover the truth. Re #39: It’s not an ad hom given the extensive evidence. I suggest starting with the narrative discussion here. Other useful pages are http://info-pollution.com/warming.htm (essentially a links page) and http://www.scottchurchimages.com/enviro/ccskeptics.asp . Ross Gelbspan’s book “The Heat Is On” is very good on this subject as well, but isn’t on the web. Maybe somewhat telling relative to the current news and discussion on glaciers is that the skeptic/denialist side appears to lack even one glaciologist. The same seems to be true of most fields related to climatology. – the warming will very likely continue and accelerate unless GHG emissions are reduced or offset in some way. The political debate does not care about scientific validity. The scientific debate is now about how much and how fast will temperature rise, how quickly will sea level respond and what will be the exact impacts on regional climates and the biosphere. If it is too hard for you to tell for yourself, what is wrong with trusting the experts in the field? All of the major scientific institutions dealing with Climate, Ocean, Atmosphere and Earth Sciences agree with the conclusions of the IPCC. Absent extraordinary evidence showing why they are all wrong, you should not worry about believing them. Why not just trust the experts? I don’t just trust the IPCC sanctioned experts, because I read the sceptics sites and they bring up really good points. I am not a climate scientist, but I do have a graduate level mathematics background and after reading Steve McIntyre paper I can’t help but agree with him. He makes sense. On the other hand glaciers seem to be shrinking, but in some places they are actually growing and ….. ugh. You can’t just write off the sceptics as easily as you would like to, at least I can’t. Crackpots have crackpot arguments and are usually pretty obvious, many of the sceptics have good arguments. Published/peer-reviewed arguments! There is really no distinguishing them if you truly approach the subject from a objective perspective. – How much warming will occur and is it significant (has similar warming occurred naturally in the past and therefore the earth has show the ability to ‘weather’ it just fine). – Can we do anything to stop it. Although I have tried to be objective the one conclusion that I have come to is that in my opinion there is nothing that we can realistically to do stop it — which makes a lot of the arguing pretty much moot except from an academic perspective. But also that is just my opinion I have formed. If someone can point me to a paper that shows how Kyoto or some such measure would actually make a difference … well I havn’t seem any such paper. Seems like people going on wishful thinking. It includes a glossary and photos which aid an understanding of the chemistry and physics at work here. Much discussion ahead on the recent papers and contributors will benefit from the Fountain/Walder paper. This page is too valuable to be hijacked by commenters who complain about the perks and grand lifestyle of IPCC Working Group members and AGW researchers. And I have a special peeve about wild idea advocates and quick fixers who believe (among other wierd ideas) seeding the melting tundra to fix CO2 back into the vegetation. How about creating a BOZO BIN for those contributions that so obviously intend to distract us and worse – make light of the serious topics Real Climate offers for discussion. Since we do not ever want to sensor scientists or their opinions, the BOZOS will have their own page to rant and diddle around. The rest of us can keep the conversation flowing closer to truth and understanding. I trust the Real Climate managers can make honest judgments and separate the wheat from the gaffs. Please consider this. It will help all of us – even the BOZOS. It seems to me that the skeptics have not moved an inch from their position in nearly 20 years. No amount of evidence will ever convince them. They wrap their views in apparently scientific language, in reality however, they are far from being scientific, they are absolutely dogmatic. This article will help the genuinely open-minded realise the seriousness of the situation and that the majority of climate scientists are very much closer to the truth than any of the skeptics. It really sickens me to hear the lament of the skeptics that they are being treated the same as Galileo. The skeptics are the dogmatic ones. Galileo based his views on objective reality, as do the climate scientists. Galileo was hounded by the dogmatic authorities and forced to recant even seeing the moons of Jupiter! I often read this site and as I am not a climate scientist, I very rarely make comments, this one was prompted on reading some of the comments in this thread. So, the glacial cycle puts us in the opposite dillema for the next few millenia, competition for atmosphere carbon. We will be in a race against natural photosynthesis, rather than a race against natural oxidation. But we will also be in a race between regions for atmospheric carbon. Hence, an intriguing economic model, the Northern regions hold vast amounts of untapped tundra and forest carbon. As climate engineers, they will want to release that carbon in stages over the millenia as southern regions remove it. 1. Old models and theories may be valuable but incomplete because there are too many variables and therefore, the system should be considered from a Chaotic perspective…the steady state of the global climate is being disrupted in a unpredicatable way. The more rapid melting of both the Artic and Anarctic regions than predicted by “theory” is exactly what one would expect from a system at the beginning stages of heading into a Chaotic state. The sytems are already outside the bounds of theory and will get further away (as predicted by Chaos Theory). 2. The best theories for what may be ahead are be those that are based on Chaotic transitions. Unpredictable disruptions, multi-varible events that are far to complex to be modelled, etc. 3. It may be more of a service to governments and policy makers to let them know that much of what is ahead in global climate change is unpredictable, but better policies would be to plan for disruptions and general catastrophic repsonse coordination. Hurricane Katrina is likely the first of many such examples of the chaotic and catastrophic events that are ahead. Smart policy makers simply should be planning for lots of disruptions as the earth’s climate goes into a chaotic and unpredictable period. 4. In Chaos theory of course “tipping points” occur, when sudden changes occur rapidly. This was not even considered as possibility in mainstream climate modelling just 10 years ago. Now of course we know that tipping points are very important in the earth’s climate and nothing could be more important for us to understand than finding out just when such points are reached. We may not be able to tell policy makers what exactly will happen after a tipping point is reached, but we can tell them it is unlikely to be pleasant for humans and they ought to prepare for major climate and weather related disruptions. easier than we can bring government regulations into effect. warming is more than twice as bad as 2 degrees of warming. because more greenhouse gasses will always make it worse.